"Never" sneered Miss Breakbone, "have I been asked to teach such a scraped-together, fiddling, twiddling, time-squandering, mind-wandering, doodling, dozing, don't-know dunderheads!" In a cast-iron military gray suit, with a blood-red mouth, Miss Breakbone is the scariest teacher character yet, one who delights in adding a gold star to her "Crybabies Chart" whenever she makes one of her charges cry. Her imagined means of torture include a knotted scourge, a nail-studded club, and an electric chair bought with the proceeds of goods confiscated from her students. Mistake Number 2: She has no eye for talent, an easy mistake to make in our case. Talent there is among those dunderheads in her much maligned class. And when she gleefully confiscates the green-eyed, one-eared cat figurine that little "Junkyard" gleaned from the trash for his mom's birthday gift, Miss Breakbone has gone too far. Student "Einstein" (a whiz at problem-solving) plots a plan to carry off a cat burglary of her grimly defended house using the special "talents" of his class of "differently abled" dunderheads. 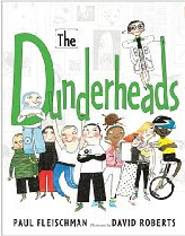 Newbery Award-winning author Paul Fleischman's latest picture/beginning chapter book features lovable knuckleheads who prove their mettle and avenge a wronged comrad in his new The Dunderheads (Candlewick, 2009), all ably portrayed by comic artist David Roberts. Kids who earlier learned to love to hate Miss Viola Swamp will relish Miss Breakbone's well-deserved comeuppance with glee.